Benjamin enjoying a late afternoon strudel at Alpenrose. Apres Ski is as much a part of Vail culture as actual skiing. But just because the snow melts doesn’t mean the sunset parties stops. Benjamin (left) at the top of the China Bowl. Adventure Ridge isn’t kids stuff. I learned this the hard way last Saturday when I made my way up to Eagle’s Nest for a day of activities at the top of the mountain. Behind a tall chain-link fence in the subterranean garage of the Lodge at Vail sat a giant beach ball—bigger than any beach ball I’d ever seen. Painted to resemble the Earth, it would eventually sit at the center of a Fourth of July float titled “Vail Welcomes the World.” As the float’s mastermind, Vail Resorts’ Bobbi Titter, was giving me a tour of this makeshift workshop late last week, she admitted she was a bit concerned. The blue and green beach ball might be too big, she said. 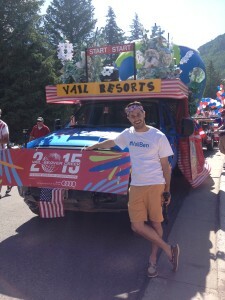 When upwards of 30,000 people lay eyes on your Vail America Days parade float, there is a lot one worries about. Photographer Jack Affleck suggests shooting with the sun at your subjects’ backs. Part of my job as the winner of America’s Best Summer Job in Vail, Colorado is to give all my friends major FOMO. What is FOMO, you ask? Well, it is that modern syndrom unique to social media users stuck behind their desk while their friends show off on some fantastic summer vacation. FOMO is: fear of missing out. 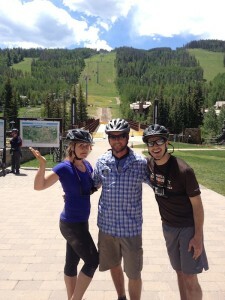 An intro to mountain biking with on of Vail’s expert guides. Benjamin (right) with friend Carrie Wilbanks and guide Steve Hill. You can’t fight Vail mountain. I learned this back in college, when several friends, who were into downhill mountain biking, told me that speed was your friend. I am not the first person to compare fly fishing to golf. 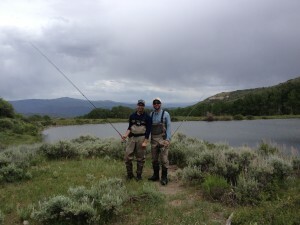 But after spending a day angling near Vail, Colorado, the parallels became clear. #VailBen Ongoing Dispatch: The Best Food I’ve Eaten in Vail. 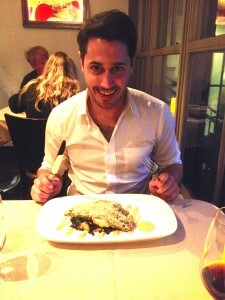 Benjamin showing off his Rocky Mountain Trout at Terra Bistro. 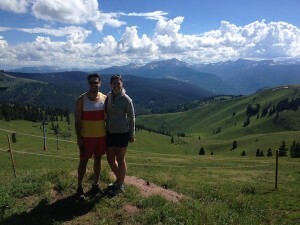 My summer in Vail hasn’t been all rivers, and mountains, and slackline lessons. Part of having America’s Best Summer Job means experiencing all Vail has to offer—and that includes the food. In fact, dining out in Vail might be one of the best perks of the job.